Weather; Snow descends across all of the map. 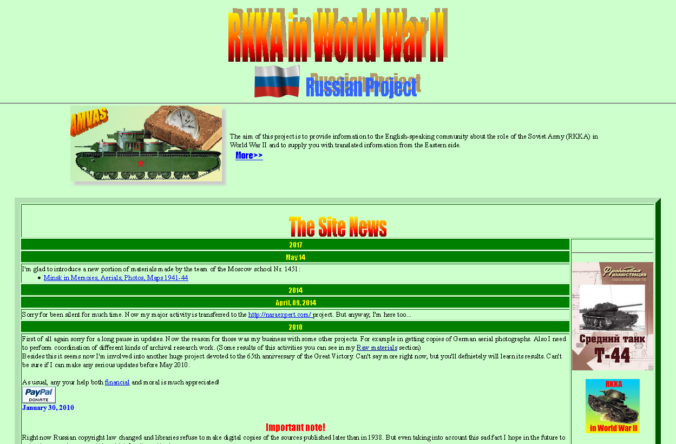 Finland & Army Norway: In the centre the German divisions continue to press forward eliminating another ski battalion and reaching within 16 miles of Kandalaksha with patrols interdicting the Leningrad/Murmansk rail line. The Finns meanwhile move to a defensive posture to rebuild the army in the south. AGN. The Axis are completely defensive on this front. The only significant part of the front out of supply is now the line north of the Valdai. AGC: A large prepared attack is made against a third Moscow hex with engineer and rail gun support now that rail conversion has reached the city but a spirited defence aided by fanatical NKVD political troops allows the two guards divisions to avoid a retreat on a HX result and hold the hex. 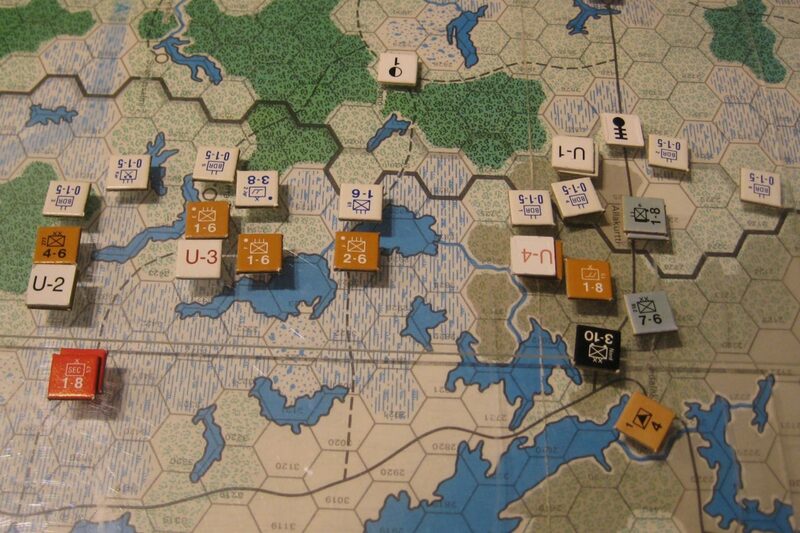 AGS: AGS is now completely defensive with a hedgehog defensive line running from the Kursk latitude down to the coast. 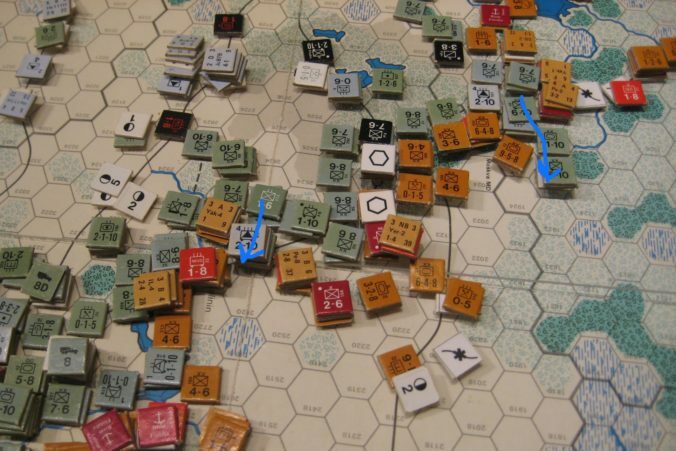 Engineers and siege artillery from the Kharkov assault move to the railhead in preparation to move south to support the Rumanians to mount an attack on Odessa and to move north to support planned attacks on Kalinin and Tula both of which are in contact with the Axis front line. 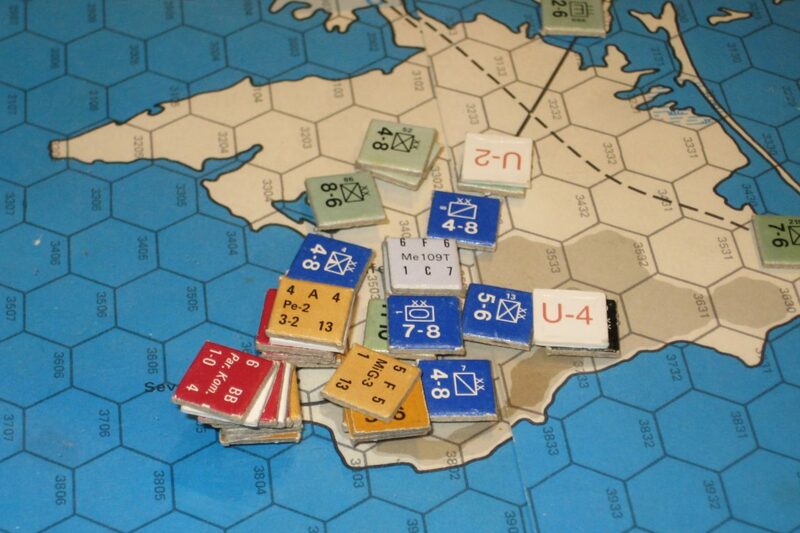 11th Army: Troops press onto Sevastopol but are not yet in sufficient strength to attack the outer defensive ring. Trucks and rail engineers move south to extend supply. The Axis mount a massive air operation over Moscow to aid the German assault on the North West hex of the city. 5 JU88s are patrol attacked away but in the ensuing air battle the German Fighter air transfer last month bears fruit as 6 Soviet fighters are brought down in the swirling air battles over the city. Some Soviet fighters survive and penetrate the screen eliminating 2 JU88s and a JU87 falls to soviet AA but the Germans clearly are the overall victors of the battle. apologies, but we had to deactivate the FAQs, since the plugin we used to display them managed to break WordPress’ backend. At least thats what we suspect, we were suffering from the “White Screen of Death” for some weeks now, and deactivating the plugin remedied parts of the trouble. We’re still having occasional whiteouts , though, and are trying to identify the source of the problem. What we can say for sure is that the site hasn’t been compromised or anything, trouble seems to be some outdated plugin code. As soon as we manage to get the backend back to working order, we’ll try to salvage the FAQs and re-up them in a different format. After all, quite some effort went into putting them together, inclomplete as they were. For now though we’re working on being able to get the site back to properly operational status.